The Benefits of Using Composite Cans For Pet Products | Canfab Packaging Inc. The majority of households in the United States include pets, 68% in fact, according to the 2017-2018 National Pet Owners Survey conducted by the American Pet Products Association (APPA). Canadians aren’t too far behind at 61% of households, according to a 2015-2016 study conducted by GFK. That equates to millions and millions of companion animals owned by both Americans and Canadians, which further translates into billions of dollars spent on pet-related products. In 2016 alone, the pet food industry in the US accounted for over $28 billion USD. That’s a lot of pet food. 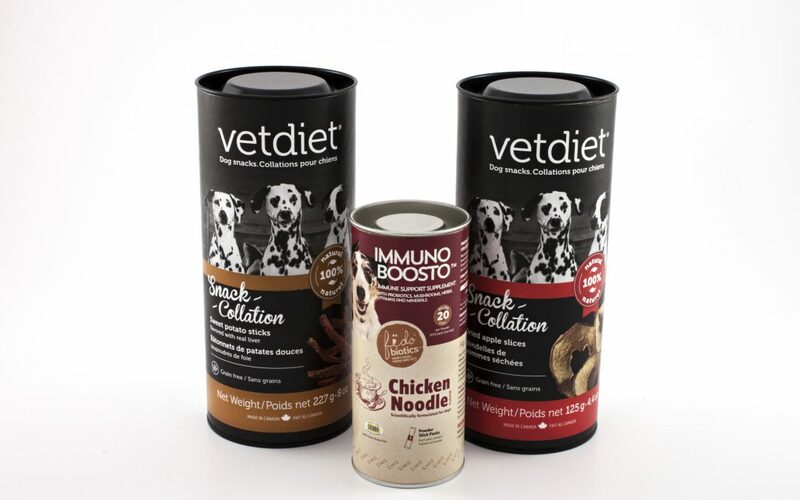 Considering the enormity of the market, companies producing pet food, or any other pet-related product, must be strategic about their packaging if they want to stand out from the competition and effectively promote their product. On top of that, ensuring that the product is kept in optimal condition is important to keeping ahead of competitors. Air, moisture, and heat can damage pet food, for example, so using a packaging method that protects it from atmospheric conditions is imperative. Whether looking to package kibble or flea powder, composite cans provide an edge over other packaging options. They’re neater to store than bags and are easily reclosable. When displayed on a store shelf, paperboard cans are more eye-catching than a plastic bag, sending the message that their contents are superior to the competition’s. On top of that, they’re 100% recyclable and are a more environmentally responsible option than plastic packaging. Packaging your pet products in a composite shows your customers that you care – about their pets, about product quality, and about the environment. Canfab Packaging Inc. has been helping companies for decades to effectively package and promote their dog treats, fish and turtle food, and more. Request a quote today to find out how you could benefit by packaging your products in our custom-made paper cans or check out our website for more information about us, our products, and how we can serve you.